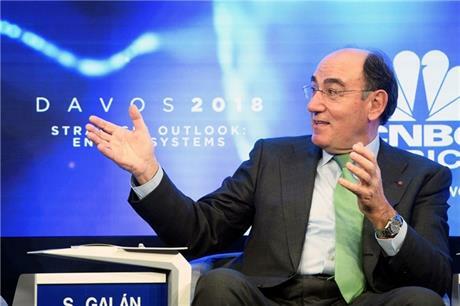 WORLDWIDE: Iberdrola chairman Ignacio Galán has supported the deployment of renewables to aid the electrification of the energy market at the World Economic Forum in Davos, Switzerland. Galán also said the battle against climate change should be seen as a business opportunity, arguing that decarbonisation and profitability were "compatible". Iberdrola said it has $100 billion in renewables, networks and hydro-pumped storage technology, which resulted in its asset base growing five-fold and its earnings and dividends by three times. "We have moved from being the 20th utility by market capitalisation to become one of the world's four largest utilities", Galán said. Speaking on a panel debate, he said the route to meeting the Paris climate goals set in 2015 was by decarbonising the economy. Galán expressed support for the deployment of renewable generation, storage capacity, smarter grid networks and electric vehicles to reach the goals. However, to do this, the global electricity industry would need to invest $19 trillion by 2025, he added. Coinciding with the global summit, which attracts business and world leaders, a new report has found less than a third of companies are embracing new energy technologies. The report, produced by European energy-management company Schneider Electric, surveyed 240 companies with revenues higher than $100 million. It found that 85% of respondents were taking steps towards efficiency programmes, including waste, water and energy conservation. But less than a third had "implemented, or are actively planning to use energy storage microgrids or combined heat and power". Fewer still, 23%, said they had considered demand response strategies. Just over half the respondents said they had pursued renewable energy projects, or were planning to. "We are in the middle of a massive disruption in the way energy is consumed and produced," said Jean-Pascal Tricoire, chairman and CEO of Schneider Electric. "The near-universal focus on conservation is a positive. However, being a savvy consumer is only a part of what's needed to survive and thrive. Companies need to prepare to be an active energy participant, putting the pieces in place to produce energy, and interact with the grid, utilities, peers and other new entrants. Those that fail to act now will be left behind."